Residential Standby Generator with Enclosure Open to Show Engine and Alternator. Standby generators supply power when the utility distribution system is unable to provide electricity. Disruptions caused by storms or by equipment failures are the most common, but other causes include traffic accidents, damage caused by animals, or even deliberate sabotage. Off grid users experience periods when the wind or sun cannot supply enough power to keep the batteries charged. Regardless of the outage cause, electricity is still necessary to keep essential electrical circuits operating. Unlike portable generators, standby generator systems are permanently installed much like a furnace or a hot water heater. Just as a furnace only turns on when heat is required, a standby generator turns on automatically when the power goes out. The generator system detects a power outage immediately and waits a few seconds for the power to return. If it does not, it starts the generator engine. The automatic transfer switch disconnects the building from the utility lines and connects it to the generator supply. It all happens just seconds after the power goes out. When the utility power is restored, the system reconnects the utility lines and shuts the generator down. Without Power, Refrigerators Can’t Keep Food Cold. Today more than ever before, we have become reliant on electrical power at home and at work. Houses rely on electrical power for sump pumps to keep basements dry, refrigerators and freezers to keep food safe, and furnaces and air conditioners to keep a home cool in the summer and warm in the winter. Without the furnace, the pipes can freeze and burst in cold weather and then flood the house when the temperature rises. Within hours after an outage, the temperature inside a refrigerator can begin to rise. With a commercial standby generator, stores and restaurants can keep the doors open while office buildings keep the lights on and computers running. Many phone systems need a source of power beyond that supplied by the telephone utility. Standby generators for emergency power keep our homes safe and our businesses open. Although diesel generators are available for residential and commercial use, the most common fuels are liquefied petroleum gas (propane) and natural gas. Natural gas from a municipal supply can keep a generator running for weeks. Propane tanks need refilling, but a propane-powered generator can also keep the lights on for extended periods, depending on the size of the tank and the requirements of the generator. Standard residential natural gas meters might not have the capacity to supply the larger standby generators. Before installation, check with the gas utility to ensure your meter can supply enough gas. You may need to upgrade the meter. Your LP gas supplier can help you determine if the regulator on your storage tank is sufficient. A tire store in Kenner, United States, has a banner in its window stating no power in the suburb post Isaac disaster. All generators have two ratings. The continuous rating is the amount of power in watts or kilowatts that a generator can supply continuously. The surge rating or maximum rating is limited to a short duration and allows the unit to start electric motors which require as much as six times the power during startup. Some generators provide more power while operating on LP Gas than they do on natural gas. The generator will have different continuous and maximum power ratings for each type of fuel. The amount of fuel used is also dependent on the amount of power used. As the power draw changes, the fuel use changes at the same time. Since power use often varies continuously, the amount of fuel used will also vary. Higher power levels use more fuel. All engines need periodic maintenance and generator engines are no exception. During extended outages, a standby generator may run for days or even a month or more. 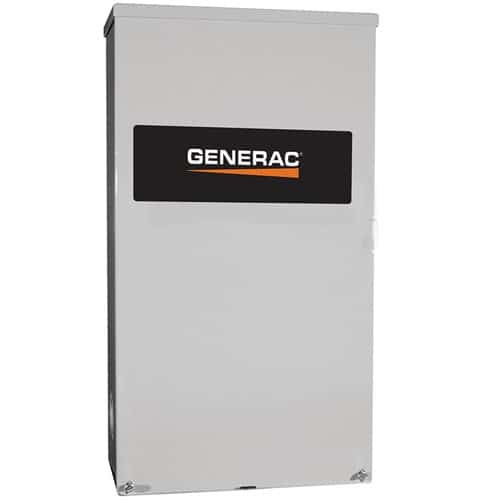 It is important to service the generator according to the maintenance schedule. Standby units need service as often as every 200 hours, or about once a week. Maintenance includes changing the oil and oil filter, replacing spark plugs, and changing the air filter. Keep supplies on hand for long outages. Also important to smooth, uninterrupted operation is keeping the generator clear of wind-blown debris or ice and snow. The vents on the generator provide air flow to keep it cool and to supply the engine. Clear away leaves, grass clippings, and other debris, and remove snow or ice that may cover the vents or the top of the unit. /n/rThis entry was posted in Generator Information and tagged air-cooled, ATS, automatic transfer switch, backup generator, commerical standby, liquid-cooled, residential standby, standby generator. Bookmark the permalink.